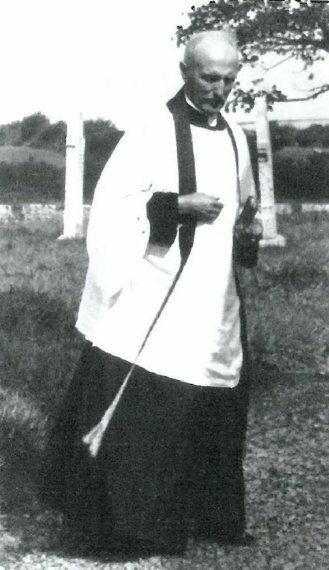 Before coming to St John’s-in-the Vale as vicar in 1907, Percy Parminter had served his curacy in the parish of Christ Church, Whitehaven from 1903 to 1905 and at Hutton in the Forest for a further two years. Probably this was his second curacy, and St John’s his first job as vicar. In 1915 he left St John’s to become Rector of the Parishes of Waberthwaite and Corney staying there until his retirement in 1955. 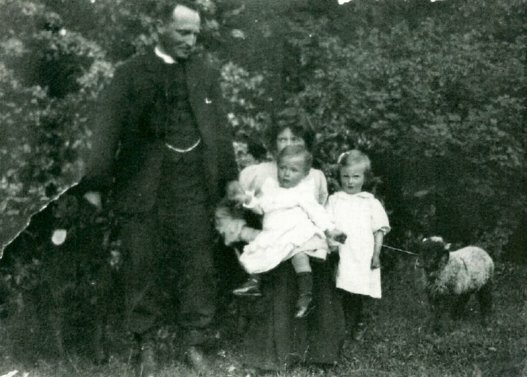 He was the son of the Revd Ferdinand and Mary Parminter, one of 10 children, and was born at Sutton in Ashfield in Nottinghamshire on 4th July 1870. After his school education he became a student of St John’s College Cambridge. He taught for a time, first of all at Woolston College, Southampton and at Harrogate College before ordination. 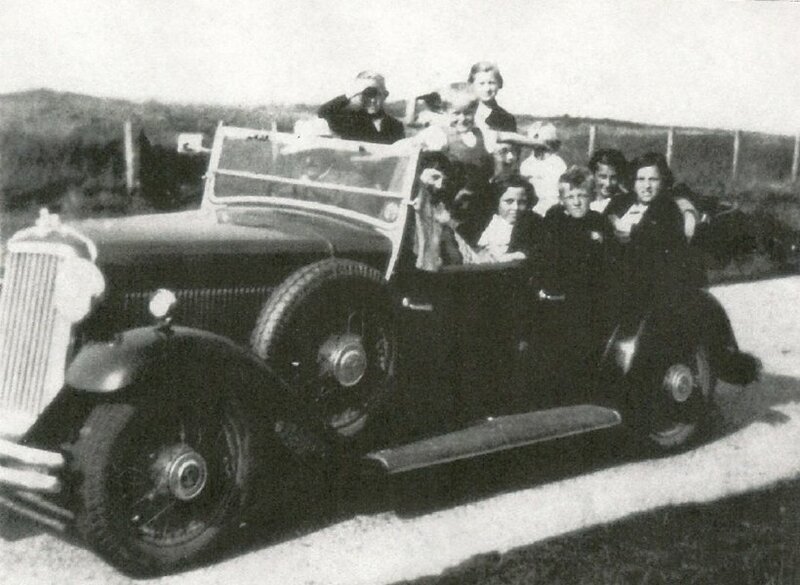 in Percy’s car in front of St John’s-in-the-Vale vicarage, with the Study window behind them, dates from his time here. This shows at least five children. Possibly a Nanny is there too. Jane Tully in 1913 (baptised 22nd January 1914). 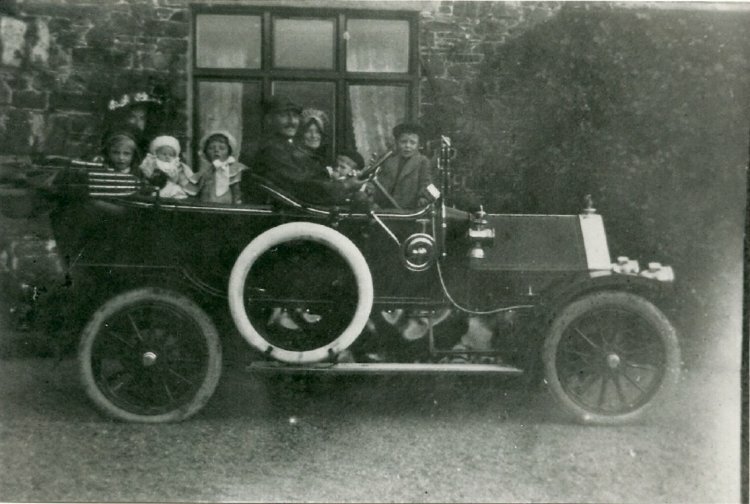 We may hazard a guess that the first picture was taken soon after John’s birth in 1912, since a baby is in the back of the car along with four other children. The second photo apparently from the same period pictures the two children once again outside the front of the vicarage. The window behind them is the south facing sitting room window. 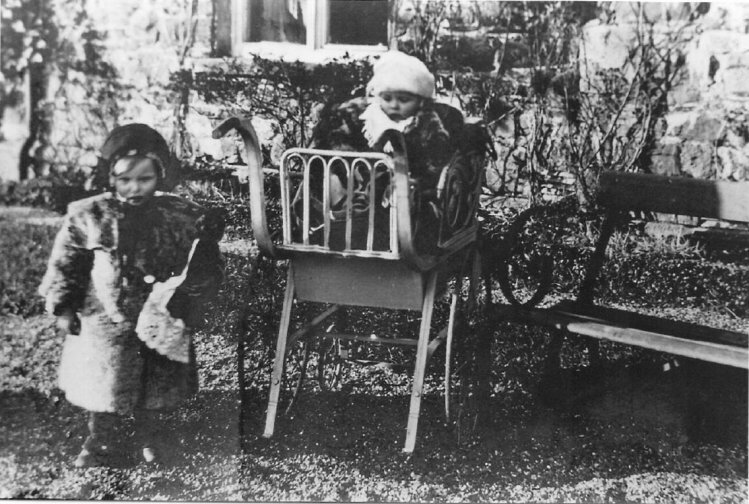 The youngest, Tommie, as he seems to have been called by the family, is seated in a very up-market baby chair with large wheels to allow it to be wheeled about. These two pictures apparently date from shortly after the second child, Thomas Ferdinand had been born, i.e. 1908-9. In 1915, the Parminters left St John’s to live at Waberthwaite where Muriel, their sixth child was born in 1916 at Oakbank, the rectory, and baptised on 24th May that year. But in 1919, on October 19th, Percy’s wife, Annie Margaret died at the early age of 43, and his daughter Muriel died only two years later on February 8th, 1921, aged 4 years. By now, Percy was 51. 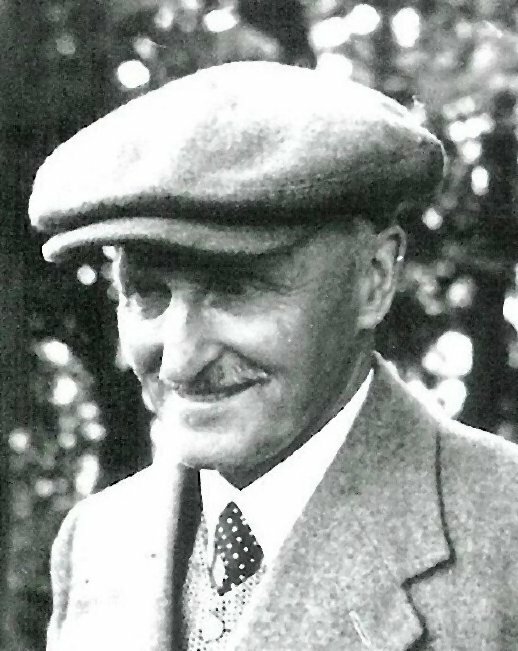 His second marriage took place only a short time afterwards on October 25th 1921, when he and Mary Elisabeth Atkinson, who was only 18 years old, were joined together in St John’s church,Waberthwaite. The wedding reception was held at the rectory, the marriage having been conducted by the Bishop of Barrow. Further tragedy was to overtake Percy, when his first child, Annie Elizabeth, was seriously injured in an accident when she was on her bicycle riding under Eskmeals viaduct and collided with a Butcher’s van. She received fatal injuries and died on April 26th, 1923. Alfred, born in 1922 was unwell, suffering from fits, and died the following February aged one year. Colin, on August 18th, 1933. We are grateful to Colin for supplying almost all the information contained in this short biography, together with the photographs. Percy and his wife lived at Lingcroft, a farmhouse in Ullock after his retirement in 1955. He still continued to take services at various parishes in the neighbourhood: Dean, Kirkland and Lamplugh, and he was still working until just one month before he died in November, 1959. His wife moved to Bluebell Cottage, near Paddle School and died in February, 1961. Both are buried at Lamplugh. As to the man himself; he was keen on sport from his youth. 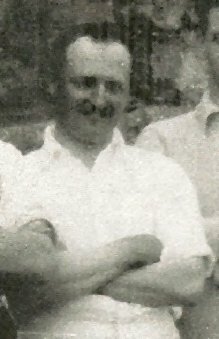 There are several photographs of cricket or football teams which include him, dating from his time at Harrogate College through to his Waberthwaite era. This may well have been one way in which as a clergyman, he could identify with the men in his parish and meet with them on a social level. He was also a keen, perhaps dedicated, fisherman, who went so far as to create a hatchery in the rectory grounds in which he stocked various tarns with trout. Apparently, when teaching children to swim, he used a pole, three or four feet long, with a fabric sling on the end to give confidence and support to the learners. The family appears to have been reasonably well-off, in that a succession of cars were possessed, and at Waberthwaite, two maids, and part-time gardeners were employed.The children were privately educated, first of all at primary level, and later at Casterton and Rossall. His interests were varied, including bird watching, on which he would lecture using lantern slides. He also produced a railway timetable, which suggests a more than passing interest in railways and steam engines. All in all, this adds up to a picture of a man of wide interests, one ready to get alongside his parishioners, a dedicated priest, and a devoted family man – a country parson in the best tradition. This first picture was snapped by the photographer unawares, while Percy was waiting for a bride to arrive for her wedding at Corney parish church. She was, apparently. Very late! Most clergy will have shared this experience at some point in their ministry. This second picture which, like the previous one dates from the 1950’s, shows Percy in a more relaxed mood.